Following the 24-hour sell-out success of last year’s Instant Eye Palette, this limited-edition, 4-eye-looks-in-1 palette is set to create even bigger eye palette MANIA. Stars In Your Eyes follows the same concept as last years palette, creating various different looks within one eyeshadow palette, from soft subtle looks to full on bold looks and anything in between. The four different looks have been beautifully named as; Love Eyes, Power Eyes, Happy Eyes & Confident Eyes. Each look has three shades; prime, enhance & smoke, in keeping with Charlotte Tilbury’s easy to follow application technique. The 12 colours in the palette come in three different finishes; matt, satin & glitter. 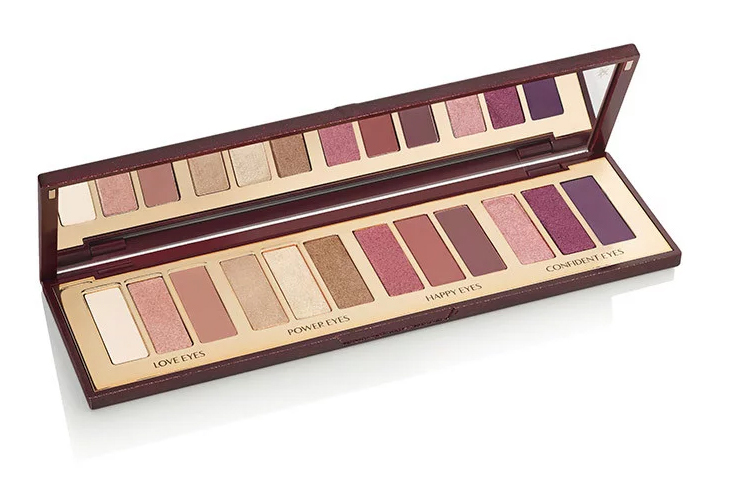 The quality of the eyeshadows in this palette are absolutely beautiful and blend so well together. In other words, they are as exceptional as every eyeshadow palette Charlotte has created. The colours in this palette range from rose gold, warm browns, golden and copper shades, burgundy and purples. You always feel like you are getting something that extra bit special with Charlotte Tilbury products and when they come beautifully packaged in this fabulous sparkly case, you truly are. If you missed out on last year’s Instant Eye Palette, don’t miss out on Stars In Your Eyes Palette.